Wszystko fajnie, ale dalej nie wiemy: kto urodził? Kto jest matką? Jaka partnerka? I kim jest ta tajemnicza Amanda? Casey Dellacqua and her partner Amanda celebrated the birth of their son Blake three weeks ago, leaving Dellacqua with more to play for, rather than any plans to compete and travel less. Her US Open singles campaign ended in Tuesday's first round, but doubles remains, through the world No.15's eighth-seeded partnership with Ashleigh Barty, and mixed, with her French Open-winning partner, American Scott Lipsky. What has been a mixed year in some respects has also been a momentous one for the 28-year-old. Parenthood is the priority now, and the popular Western Australian is loving it. If anything, I don't know, it makes me a bit more motivated, because I've got something to play for. I'm out there for my family now. "I think you see a lot of players out on tour with families, and I'm still motivated, and I'll make it work, we'll make it work as best as we can, and hopefully they'll be able to do a bit of travel, and we can get him a passport and introduce him to the tour," Dellacqua said after her 2-6, 6-1, 6-4 loss to fellow qualifier Ajla Tomljanovic, a strong-serving 20-year-old from Croatia. "If anything, I don't know, it makes me a bit more motivated, because I've got something to play for. I'm out there for my family now, and it's been an exciting time. Tennis has always been something that I'm passionate about, but it's not everything to me. It's an elite sport, but there's so much more to life and, for me, that's what life's about - about family - so I'll try and make it work." Dellacqua suffered serious shoulder and then foot injuries the year after reaching the fourth round at the 2008 Australian Open, and cutting her ranking to a career-best 39th. She is healthy again, but took unofficial family leave between Wimbledon, where she and Barty reached their second grand slam doubles final of the season, and the US Open, where she was disappointed not to convert an encouraging run through qualifying and a bright 4-0 start into an overdue first tour-level victory of the season. While her doubles ranking has soared, she is labouring at 184th in singles, although there are no plans as yet to specialise. "Obviously we've had a lot of success in doubles, and it's hard when your doubles ranking goes to 15 and your singles is lagging behind, because it's hard to put a good schedule together where you feel like you're focusing on one thing," she said. "But I wouldn't take back those finals that Ash and I have played, and all the doubles results back for anything. I'm still motivated to play singles, and I'm still really keen and want to improve, so that's kind of where I'm at, and I want to continue to play, so I'll try and put a good schedule together." With, now, another - very important - element to factor in. "I'm loving motherhood, it's great," she beamed. "I think you all know I'm pretty normal, so my whole thing in life is family, and it's been a really exciting time for me, and it was my time just to be at home, and to be with my family, and it was the best time that I've had at home for a long time, and most exciting, so it's awesome... And now I'm back playing, I'm back to work and, yeah, we'll go from there." For those who remember Casey Dellacqua as the sunny, Monaro-driving, Target-wearing everywoman whose flag-wearing nan, Bev, cheered her into the fourth round of the 2008 Australian Open, much has changed in the six years since. Sometimes, the same career feels like it was a lifetime ago. In some respects, it almost was. Dellacqua, now 28, has endured two serious injuries - one requiring a shoulder reconstruction, and the other to repair a broken navicular bone in her foot - that cost her almost two full seasons, as a ranking that peaked at No.39 six months after her thrilling run to the last 16 at Melbourne Park plunged past 1000 by the end of 2009. While she has reached grand slam doubles heights, as the winner of the 2011 French Open mixed and a three-time major finalist with teenager Ash Barty this year, singles success has been more sparing. Most recently, there has been parenthood, with Dellacqua's partner Amanda giving birth to baby Blake in July. When the Perth left-hander returns to Melbourne for next month's Australian Open wildcard play-off, it will be as the national women's No.2 behind Sam Stosur, but 131st overall - a rise, nevertheless, of more than 50 places in the past month, due to back-to-back Challenger titles at $50,000 events in Bendigo. 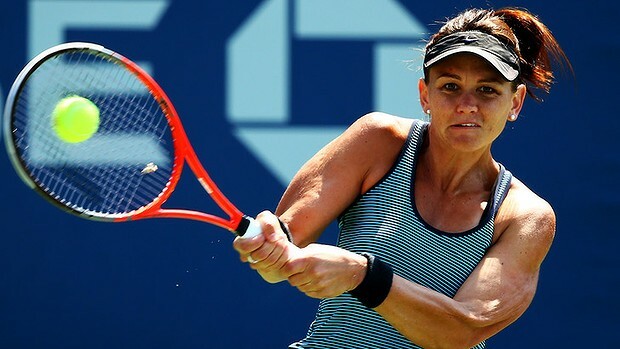 ''Obviously I've had a pretty good year in doubles, but I just really wanted to try and play some singles and focus on that for a few weeks, and try to get my ranking back up,'' Dellacqua said this week. ''I haven't played bad singles all year, I've had some really good weeks, it's just been a matter of being able to concentrate on that a little bit more, and for two weeks that was my focus, and I was stoked to win both of them. ''I'm quite happy where I'm at, at the moment. My body feels great, and I feel really fresh mentally, and to make three slam finals has been absolutely amazing. It would have been nice to win a couple, but the fact that we were there in the final and at the latter stages of the biggest tournaments, it's actually amazing to think we made three slam finals in one year. Yeah, it's been pretty bloody good.'' Indeed, if there has been a more endearingly natural character in Australian tennis in recent years, it is hard to recall. Yet Dellacqua can barely remember what it felt like to bask in the national spotlight for one glorious week, which seems so long ago. In this life, Amanda and baby Blake travelled to Bendigo, for much cooing and cuddling (of Blake) and enough sleep (for Amanda and Casey) for all to manage quite well. It was the new family's first road trip, and there will be more to come, especially to avoid the long stretches (like during the mid-year clay-grass period) when it is impossible to squeeze in a visit home to Sydney. ''He's at a good age where he's easy to travel with and stuff at the moment, so they'll come, and hopefully my mum will be able to come away and help out a bit, but we'll just make it work, and so far so good. I haven't lost too many matches since he's come along, so I think he's been my lucky charm!'' laughs Dellacqua. ''He's been a great little baby, he's a real happy little man, and it'll be nice to have my family with me. It will make life on tour a lot more enjoyable.'' There is also a little more to play for - not so much the pressure to provide, as the desire. Motherhood has changed the way she sees things and given her greater perspective to what happens on the court. ''At the end of the day, however I go, I still get to go home to a beautiful family, and that's all that matters, so I don't see it as a pressure thing or 'I've got to do well for them', because I've had a good career. It's just more the fact that I do want to make him proud, and hopefully one day he'll get to watch some videos and be proud of what I achieved.'' So, was there much reaction to the news of Blake's arrival, after it was confirmed to a small group of Australian reporters in New York? ''Um, not too much, to be honest. I don't know. I feel like people have babies every day so it didn't really feel like it was … yeah, no, everyone's been great, and at the end of the day I've got so much beautiful family, from all our family we've got so much love and support, and that's kind-of all that matters. But everything's really positive. It was fine, it was all good.'' As is her five-month association with new coach Shannon Nettle, the pair having shared an important talk early on that crystalised Dellacqua's priorities and ambitions in the time she has left - two years ''at 100 per cent'', she says, at a minimum. The world's 10th-ranked doubles player wants to extend her focus on singles, in which Tennis Australia's Todd Woodbridge declares the fine ball-striker ''should be entrenched around the 50 mark, at least''. Thus, Dellacqua's first aim is to finish January back inside double figures, which is highly achievable given that first-round losses in Sydney and at the Open this year leave her with few points to defend. From there would come direct entry into the majors and big, lucrative events such as Indian Wells and Miami - although doubles accounted for most of her 2013 prizemoney of almost $600,000, and eased the financial load considerably. Nettle has Dellacqua again playing the type of tennis that carried her into the top 40, and there is a renewed urgency that, as 30 approaches, there is little time to waste, and many boxes to be ticked. ''Shannon just gave me that real understanding of 'this is where we're going to head, this is my game style, this is the way I'm going to play, and let's go from there', so he's been awesome''. Doubles-only is not an option, although it may become one. Surely it beats a ''real'' job? No, może będą z niej jeszcze ludzie?